A bride’s hairstyle on her wedding day plays a crucial role in her overall look. A huge trend this year is the half up half down hairstyle. It basically combines tresses worn up through the sides and the crown while the remaining hair is down to the shoulders from the middle of the scalp. In this guide, we will be covering 15 gorgeous half up half down hairstyles with description and brief half up half down tutorials for DIY brides. 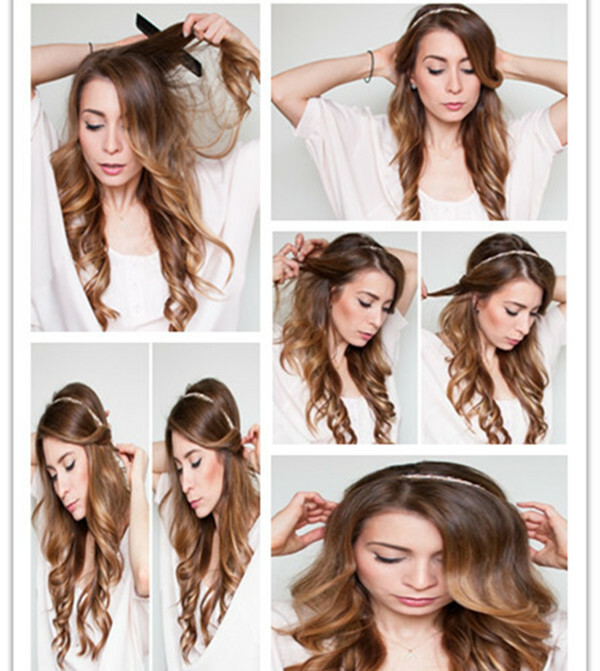 We love this simple half up half down hairstyle, its tutorial is equally simple too. The combination of soft, romantic curls with a simple ribbon is surely inspiring. If you are looking for something easier, this half up half down tutorial is what you need. Create volume by making some curls with curling iron throughout the hair. Lightly smooth over the top tier of the teasing hair. Gather a small section of hair under the teasing area and secure it with bobby pins. Tie the sections of hair around the face together with a small rubber band. Loosen the hairstyle with the end of a rat tail comb. Finish it with a simple ribbon. 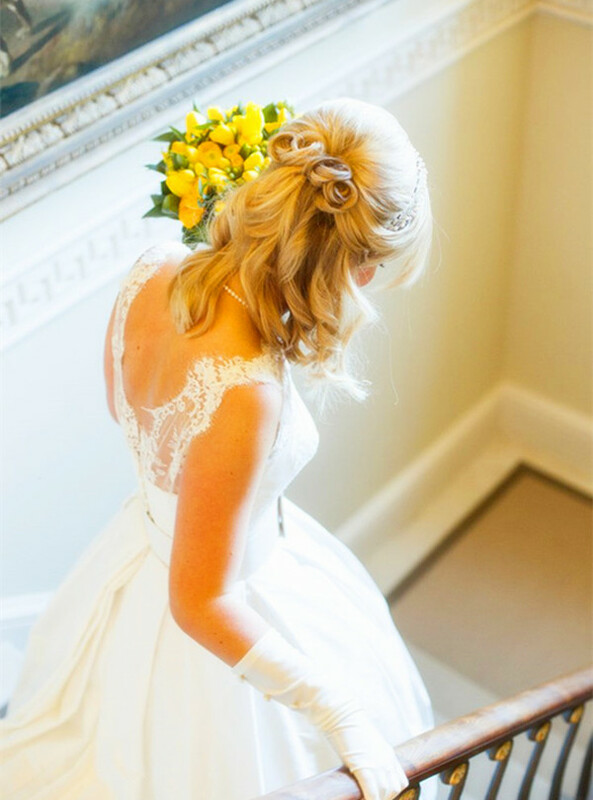 This is an elegant twisted half up and half down hairstyle, ideal for brides with naturally curly hair. Those with straight hair can use a curling iron to achieve the look. Section the hair on both sides of your head. Tie them together with a small rubber band. Twist it at the back of the crown. Curl the remaining hair with a curling iron (if you have frizzy flyaway hair, use a smoothening spray or serum to tame it). 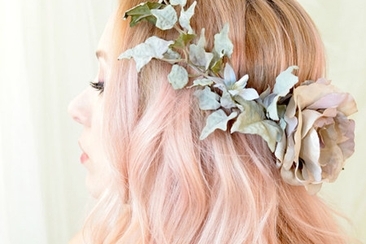 Pretty up the twisted hair with a beautiful heirloom pin. This simple half up half down hairstyle reminds me of a Disney princess. It is soft, romantic and beautiful. The best part is the hairstyle’s flexibility. Here is the tutorial to achieve this elegant look. 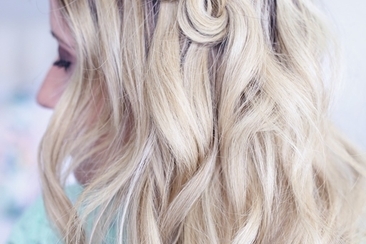 Create loose curls with a curling iron from the ears down. Split your hair in the middle and separate the curls with your fingers. Spritz the roots of your hair with hairspray. Tease the sprayed part with a tooth comb to create a volume. Smooth the teased hair with a brush. Gather the sides together into a half ponytail and secure it with bobby pins. Shape the curls into place. This half up half down hair wrap is super easy and it works well with both straight and curly hair. This hairstyle brings you a romantic, sweet and mysterious look. How to achieve this simple half up, half down hair wrap for yourself? Tease the root of your hair to create a volume. Place an elasticized headband over the crown of your head and secure it. Take a section of hair on one side of your head and wrap them around the base of headband completely. Repeat the last step on the other side of your head. Smooth the hair that sprung up when wrapping. This overlapping half up half down hairstyle looks very gorgeous. It can highlight the natural texture of your hair. This striking hairstyle is perfectly for summer regardless of whether your hair is thick or thin, straight or curly. What’s more, it only takes merely minutes to accomplish. Take a small strand of your hair from the ear above. Secure this strand at the 3/4 of it with a bobby pin. Take the third strand from under the first one, pull it above the second one and then pin its end under the second strand. Take the third strand from under the first one and pin it under the second one. Repeat the steps two more times. We love this tuck and cover hairstyle so much for it really looks pretty, eye-catching and sweet. The soft fabric headband makes this hairstyle easier to do because it has a no-slip grip. Try it by yourself with following half up half down tutorial here. Place the headband over your head, about an inch behind the hairline. Take a small section of hair on the left side and tuck it into the headband. Loop this section of hair back into the headband and pull it throughout the bottom. 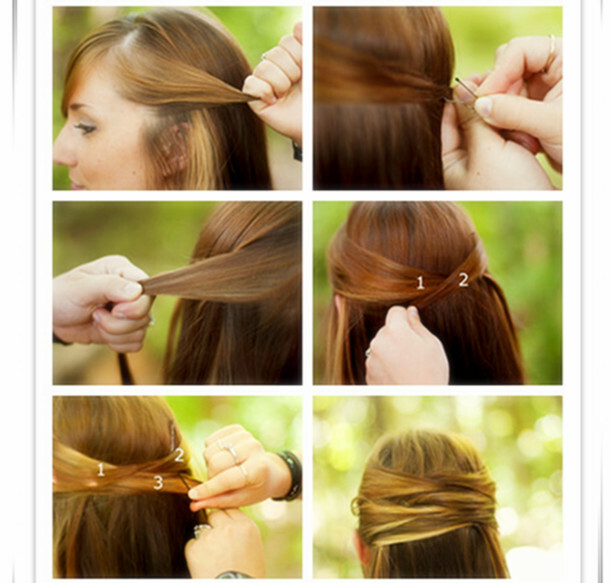 Loop the same hair again across the headband and pull it through. Repeat last three steps on the other side of your head. Cover the headband completely and pull the hair together. Romantic, sleek, understated. Those are the words that come to mind when looking at this bohemian knot half up half down hairstyle. This style is best suited for a medium-length hair in a relaxed or casual wedding. Curl your hair with a small barrel curling iron. Take a section of hair on one side of your head to create a fishtail braid. Repeat last two steps on the other side of your head. Tie the two fishtail braids into a knot. Tie the knot one more time and secure it with bobby pins. 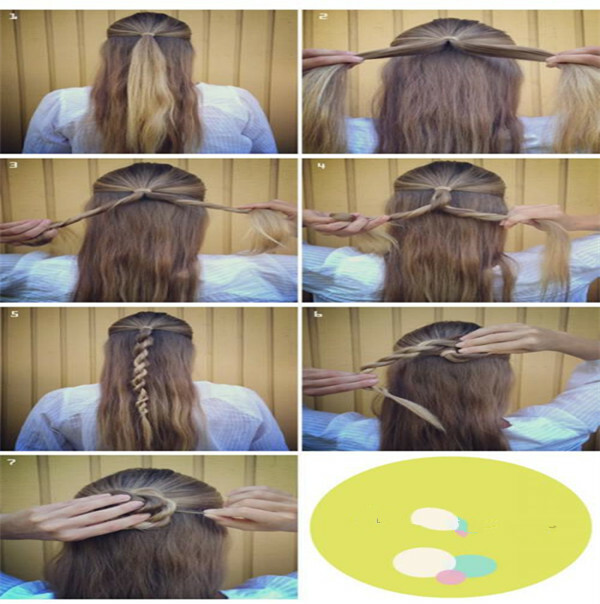 Remove the elastic bands and let the braided ends fall straight. The half up half down waterfall braid is a soft and romantic choice for long-haired girls. The twists are so pretty that they seem to cascade across your hair. 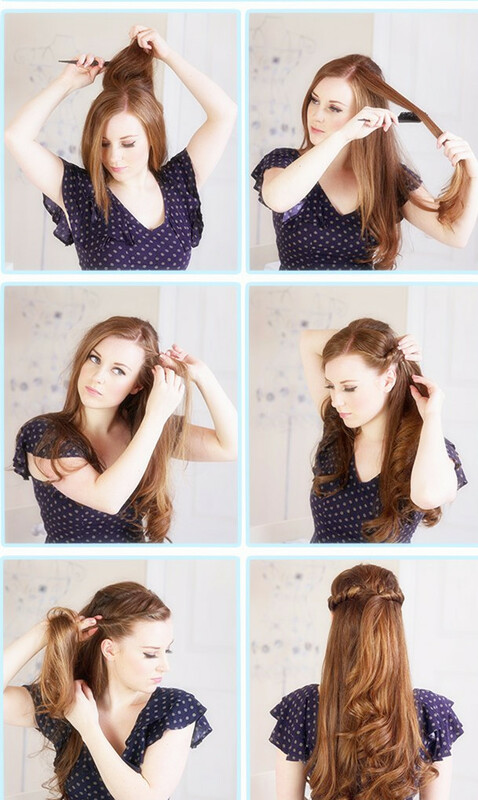 This half up half down hairstyle only needs few steps but makes you graceful. Take a section of hair at the side of your head. Divide it into 3 sections. Add more hair into the braid outside of the three original portions of hair and drop the top section of your braid and let it fall. Keep moving around the head and remember to drop the top section every time you add more hair into the braid. Once you have braided to the other side of your head, secure the end of the braid with bobby pins. This is a simple, classic side swept which is ideal for those with square face. It is recommended to be avoided by those with round face. Wash your hair the night before because you certainly do not want that greasy look. Separate your hair into 2 sections: all the hair from the top of the ear down and all the hair above the ear. Clip the above section out of the way, to the top of your head. Take the section of hair on top and tease it to create volume. Take the hair down your ear into a small, loose ponytail, pulling to the side. Sweep the teased hair and pull it to the back of your head. Secure it to the back of your head with bobby pins. Color your hair in ombre or add highlights to achieve this twisted half up half down do, a perfect hairstyle for a beach wedding! Want a simply tutorial for this hairstyle? Section your hair from the sides. Tease the hair from the back of your head to create a volume. Take a small section of hair on one side, braid it to the ends. Take a small section of hair on the other side, braid it to the ends. Twist and braid them together just behind and below the crown of your head and pin it with bobby pins. Curl the remaining hair and leave them in a shabby chic way. The hair up hair bow here is a very delicate, pretty and girly hairstyle. It would be perfect for any event in summer, also for a wedding. You can choose to curl your hair or leave it straight. Want to know the steps of this hairstyle? Follow is the half up half down tutorial. Take a small section of hair from each side of your head. Tie the two sections together with elastic to create a half ponytail and create a loop. Split the loop into two smaller loops and clip one loop aside for later. Spread out one of the smaller loops with fingers and make it flat into a half bow shape. Secure it with bobby pins, from top to bottom and from bottom to top respectively. Repeat last two steps on the other side to complete the bow shape. Wrap up the remaining ends of the ponytail around the elastic and secure it with bobby pins. 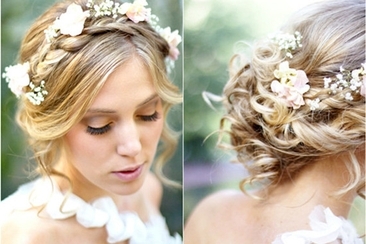 This pretty twisted or braided half up half down hairstyle is recommended for a garden wedding. It is ideal for brides with thin hair. A pretty crown, headband, or pretty necklace is needed to tie around your head. Take a small section of hair from the front on one side and braid it to the ends. 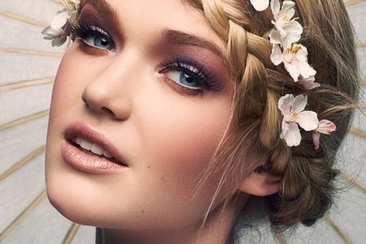 Wind the braid once around your crown. Take another small section of hair from behind your first one and braid it to the ends of your first braid into a new braid. 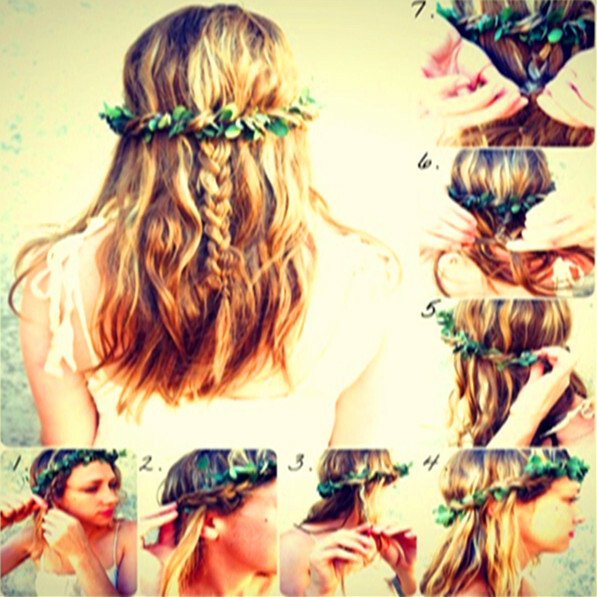 Wind this braid around your crown. Repeat above steps to make the third braid around the crown and just hang down the free end. Braid the two free braid ends and secure it with elastic. Simple but romantic and gorgeous, these words come to my mind when look at this half up half down tie-back, and a perfect hairstyle for relaxed weddings or other events! Split your hair from the middle of your forehead. Take a strand of hair from the right section, roll it towards the back of your head and secure it with bobby pins. Take a strand of hair from the left section, roll it towards the back of your head and secure it with bobby pins. Cross the two rolled strands together and secure it with bobby pins. Spray all over with hairspray. Curly hair sometimes needs something extra to make it more beautiful on its simple look. 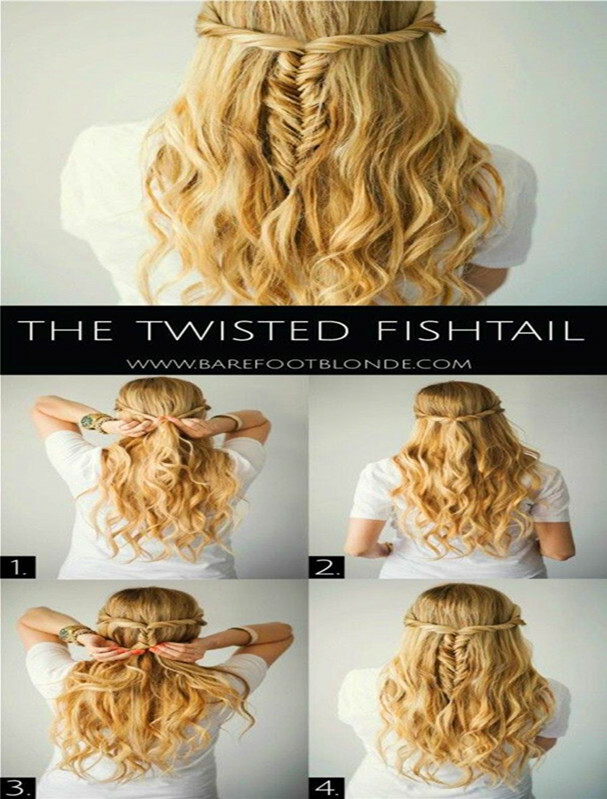 Half up half down fishtail braid can do it and add a little bit flair to your hair. To create this hairstyle, find the tutorial here. Take a section of hair on one side and roll it. Take another section of hair on the other side and roll it. Take both rolled strands towards the back of your head and tie them together with elastic. Separate the hair into two halves to create a fishtail braid. Take a small piece from one side, cross it over the top and add it to the other. Take a small piece from the opposite side, crossing it over the top and adding it into the other. 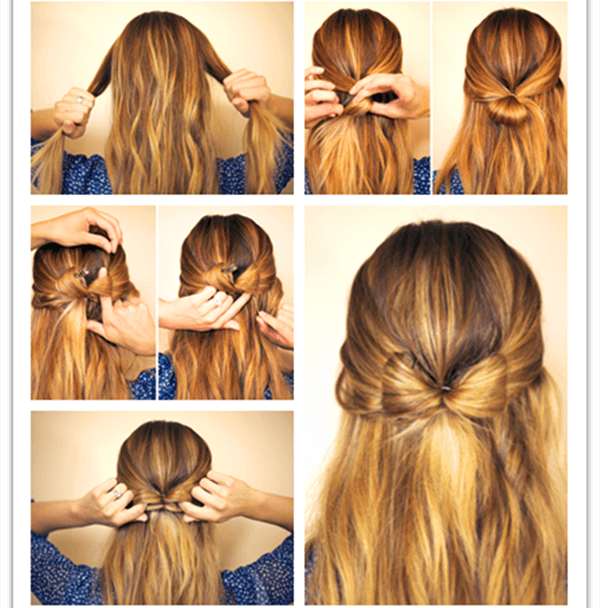 Braid all the hair and tie off the end with elastic. This half up half down hairstyle with a twist bun might look complicated but is quite easy to achieve. The twist bun looks very pretty and you can wear it with your hair straight, curly, or wavy. Work this super easy and fast hairstyle with the following half up half down tutorial. 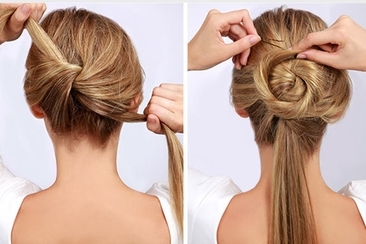 Create a half-up ponytail firstly. Split the ponytail in half. 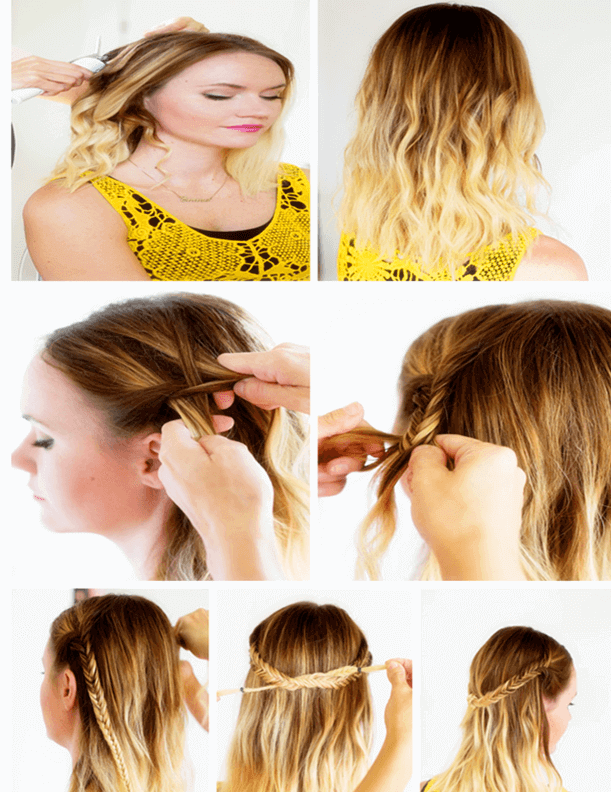 Twist the two parts of hair respectively in the same direction to make two braids. Then twist the two braids together to make a rope braid. Twist it around the ponytail. 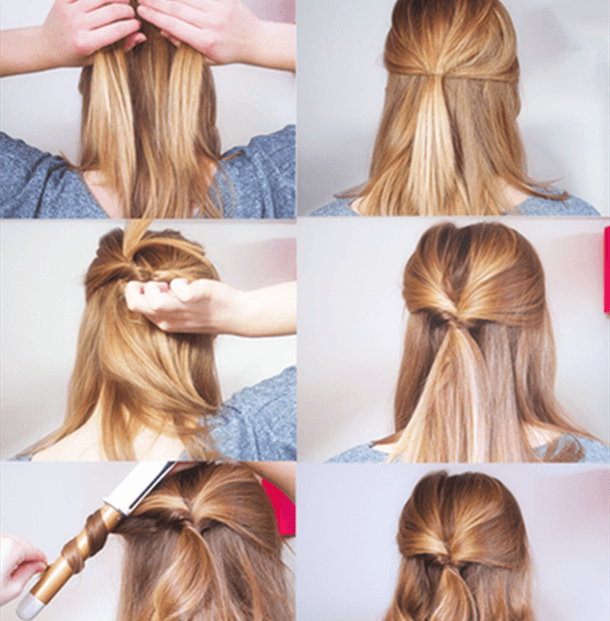 Shape it into a bun and secure with bobby pins.